I am not a violinist so I have no idea what does it mean; cannot find anything on the internet; there is no performance indication about this on the score. Any ideA? They are actually natural harmonics. (natural harmonics) Harmonics are overtones of the string and produce soft flutelike sounds when the string is lightly touched at specific fractional divisions (nodal points). Natural harmonics are produced on open strings, and artificial or stopped harmonics are produced on stopped strings. Composers often indicate which string should be used for the harmonic by notating above or below the note markings such as sul D, D string, or III (meaning, play the harmonic on the D string, the third string on the violin). Natural harmonics are indicated in two ways: by a small "o" written above the note to be lightly touched, and by a small diamond shape at a specific point on the string where the finger should be lightly placed. You can also get a list of all natural harmonics for violin from this site. I consider that notation problematic, but it almost certainly means you should play a D6 as the fourth harmonic of the open D-string. That mode can be obtained as a flageolett-stopped note with the finger on the D-string at the spot where you would normally play G4, hence the little diamond-shaped G note. 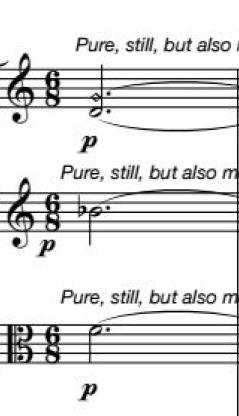 But the correct way to notate this, IMO, is actually to just write the pitch that should sound, i.e. As always, dolmetsch has this covered. That's my go-to page for nearly all notation questions. [o] in string parts: written over or under the note-head, meaning: play a natural harmonic referring to percussion notation the Percussion Information Homepage - Problems page author writes: "one very annoying side effect of different setups, is the fact the most method books that indicate which hand to use for a certain passage, are difficult to use for players who are learning the other way! So, my advice to publishers and writers: Never indicate hands. And if you have to, use symbols like an open and closed small circle or square above the notes. In that way we just have to change the definition of the symbols and explain that to the student. But it is very unnatural to have to play a note with your L-hand when there is a big R above or below it. Especially when these very letters mean the same hands in another language!" This notation indicates a harmonic. Harmonics are played by lightly touching a string at one of several specific points along its length, preventing its fundamental tone from sounding while allowing certain overtones to vibrate. Which overtones vibrate, and hence what pitch is produced, depend on the fractional point, referred to as a node, at which the string is touched. There's a distinction between natural and artificial harmonics. Natural harmonics are played on an open string. Artificial harmonics are played on a stopped string, typically stopping with the first finger and touching a node with the fourth finger. There isn't a standard way to distinguish between natural and artificial harmonics in notation. Some harmonics can only be achieved by stopping the string, while others, such as the one in the question, could be played either way. The example could be played as a natural harmonic, by touching the open D half way along its length, or as an artificial harmonic, by playing in fourth position on the G string. Where there's a choice, it must be made based on the musical context. Without more context than the single bar of music posted, it's impossible to say which choice is correct here. What's coming next? If the next change of note is, for example to a harmonic one tone higher, maybe it makes more sense to play the D in fourth position then shift up. Maybe there's a glissando coming. Maybe vibrato is appropriate, in which case an artificial harmonic is needed, since you can't vibrate a natural one. The lower note,the open D would be played with second finger on the G string in third position, and the G diamond note would be played with first finger on the D string in third position. The violinist would have two fingers down on the fingerboard, however the diamond shape note is not pressed all the way down to the fingerboard. It is an artificial harmonic. To produce an artificial harmonic, a stringed instrument player holds down a note on the neck with one finger of the non-dominant hand (thereby shortening the vibrational length of the string) and uses another finger to lightly touch a point on the string that is an integer divisor of its vibrational length, and plucks or bows the side of the string that is closer to the bridge. This technique is used to produce harmonic tones that are otherwise inaccessible on the instrument. ... The round note (below) is pressed with one finger, and the square note is lightly touched with another one. What does “sax loco” mean?